Philosophy believes in miracles. We also believe in miracles, but miracles by using an Anti-Aging (Eye) Cream? Hmmm no, we are not that naïve anymore. 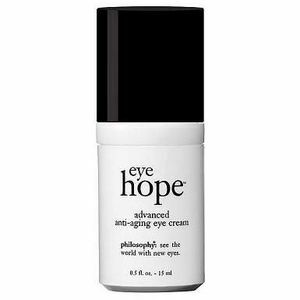 When I bought this Eye Cream, I wasn’t expecting miracles, BUT for my $50 (0.5 fl. oz./ 15 ml), I WAS expecting a good Eye Cream. The packaging is ok and the pump work fine. The cream feels very light and doesn’t irritate my eyes. It’s also not sticky and smells fine. First of all, this is more a make up for under the eyes and it will trick you, because you THINK it’s working. It contains mineral pigments that add shine to the skin under the eyes, to improve the appearance of dark circles, BUT it doesn’t contain any ingredients that have a permanent effect on lightening dark circles. Second; you run out of eye-cream very fast. After 3 weeks you have to buy a new one if you want to continue, which I didn’t. Last but not least; It just doesn’t do your skin any good, it doesn’t have a sunscreen which makes dark circles only worse if you live in sunny California like me. Conclusion; it isn’t a very bad moisturizer, but it doesn’t do what it claims. Ohh and one more thing; Philosophy, if your reading this post, just be more honest to your consumers. Don’t sell them hope, it’s just not fair.